For over 20 years, we’ve operated our bakery from our location in Bantry. Our bakers specialise in healthy bread and snacks — made fresh every day — that we serve in our cafe and sell in our shop. At Organico, we like to be inside the kitchen, mindfully and joyfully engaged in the process of creating the food we prepare for you. That’s why it just makes sense for us to run our own bakery. Since our bread is made by us, we know for sure it’s made with care and a commitment to healthy ingredients. All of our bread is made by hand with stone-ground, organic flour. We let our dough rise for a long time to develop its flavour and improve its texture. This long ferment also increases the bread’s digestibility. We offer several different loaves including sourdough, whole grain, oat, seeded, gluten-free, and varieties of spelt, both white and brown. Spelt is our go-to flour for our cakes, cookies, brownies, pasties, pizza bases, and scones. We find it tastes great, it’s easy to digest, and it’s an ideal alternative to modern wheat varieties. Isn’t it remarkable how a simple loaf of fresh bread can transform your meal from something good into something memorable? That’s why we stock our shop with our freshly made bread every day, so a memorable meal is always within your reach. To make sure you get the bread you want, you can preorder from us by calling (027) 51391. 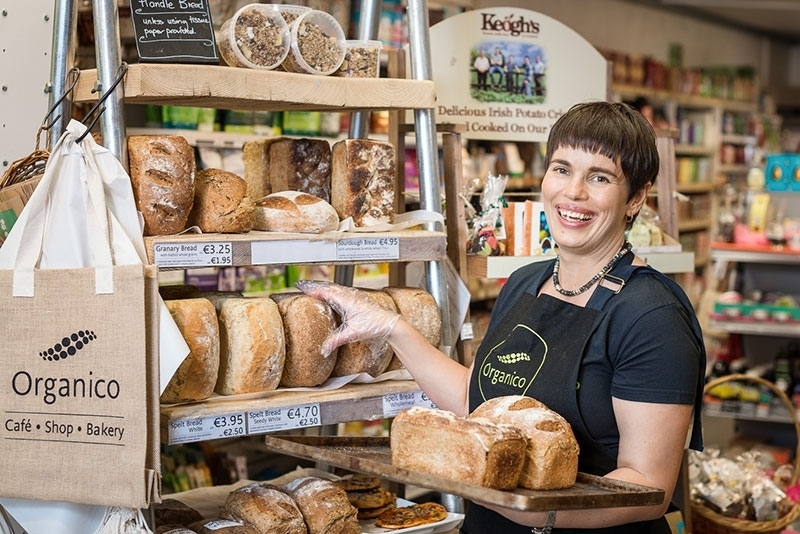 We’re also happy to ship our bread to anywhere in Ireland via An Post’s next day delivery service. Many of our customers who live far away place a large order with us which they store in their freezers, that way a fresh loaf is always at hand.